← Have you hugged a farmer lately? A fantastically delicious and easy breakfast treat! Who says popovers (also known as Yorkshire Pudding) should only be eaten as part of a traditional roast beef dinner? These lightly sweetened, fruit-filled beauties taste very similar to crepes and are the ideal treat for breakfast or brunch. As a bonus, they’re super quick and easy to make. You can even prepare and refrigerate the batter the night before to speed things up in the morning. Combine 1 tablespoon sugar and ground cardamom in a little bowl and set aside. Put one teaspoon of the butter into 8 large muffin tin compartments. Make the batter: whisk milk, eggs, 1/4 cup sugar, and vanilla together in a large bowl. Whisk flour into the milk mixture and continue whisking until it forms a smooth, runny batter. You can use a regular or immersion blender for this process if you like. Let sit for at least 5 minutes so flour can hydrate. While batter rests, put muffin tin in preheated oven until butter melts, about 5 minutes. Give the batter a quick whisk then pour into hot, buttered muffin cups, dividing equally. 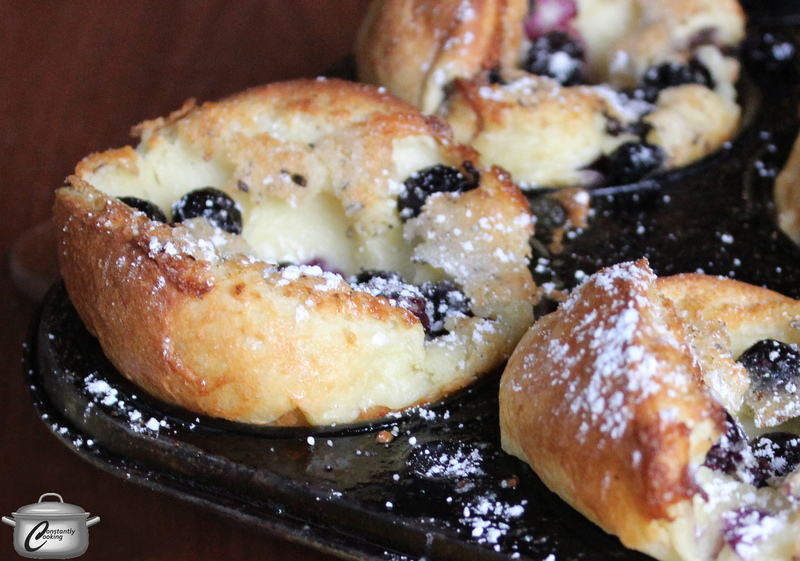 Drop 1 tablespoon of blueberries into batter in each muffin compartment. Sprinkle sugar-cardamom mixture evenly over the blueberries. Bake in preheated oven for 5 minutes then reduce heat to 350F and continue baking until popovers are dry in the center, about 25 minutes. Remove pan from oven. Note that the popovers will deflate slightly as soon as you remove the pan from the oven; this is normal and does not affect the taste. Transfer the cooked popovers to a serving plate, using the tip of a sharp knife if needed to loosen them from the muffin pan. 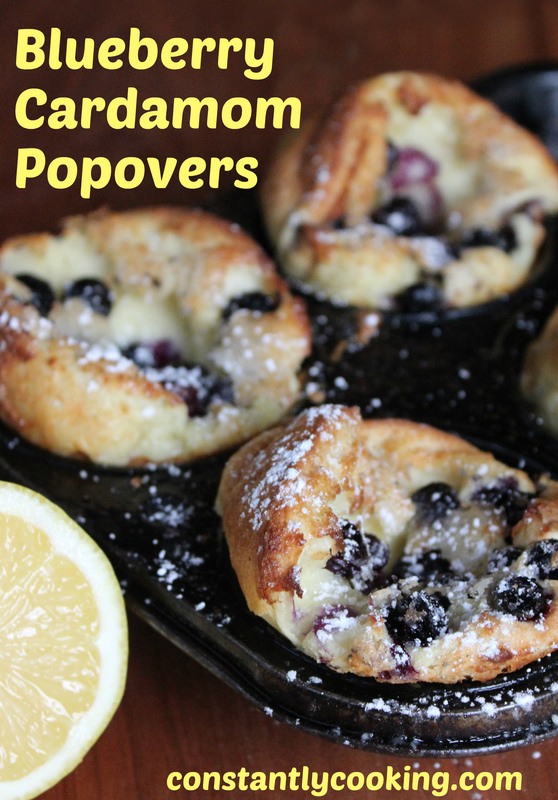 Squeeze lemon juice over popovers, then dust the tops with icing sugar. Serve immediately. 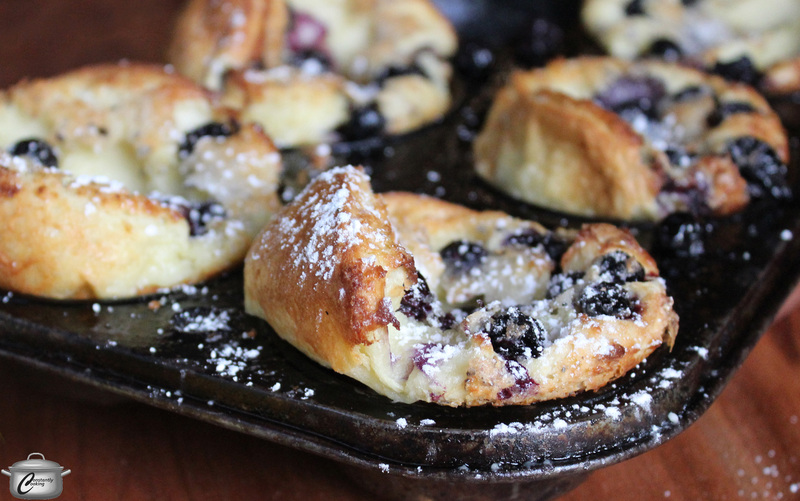 This entry was posted in baking, Berries, Breads, Breakfast, brunch and tagged alternative to muffins, blueberries, breakfast pastry, brunch, cardamom, crepe batter, make-ahead, Paula Roy, popovers, sweet pastries, Yorkshire Pudding. Bookmark the permalink. Nice to add cardamom powder, I can imagine its sweet fragrance! Thank you! I adore cardamom and use it often (but always freshly-ground).